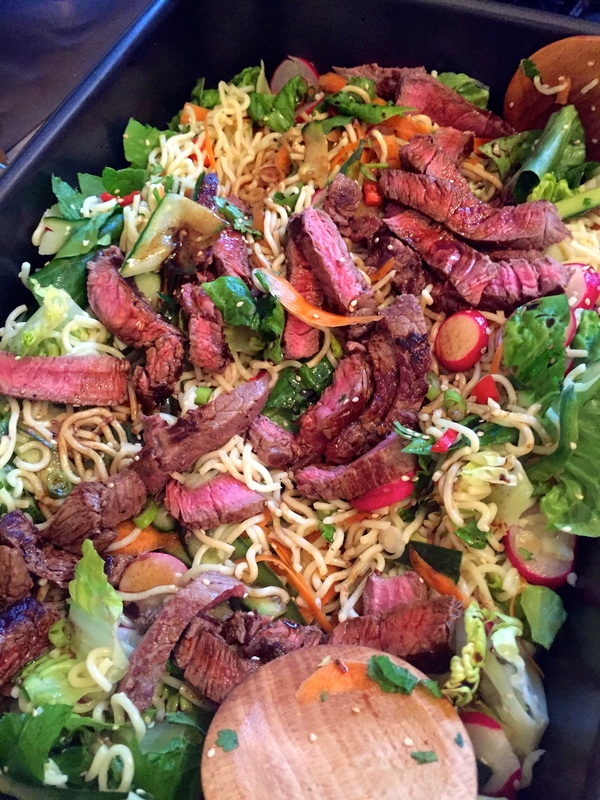 Beef up your salad the Thai way! A Perfect Summer Lunch Dish Bursting with Zingy Flavours! 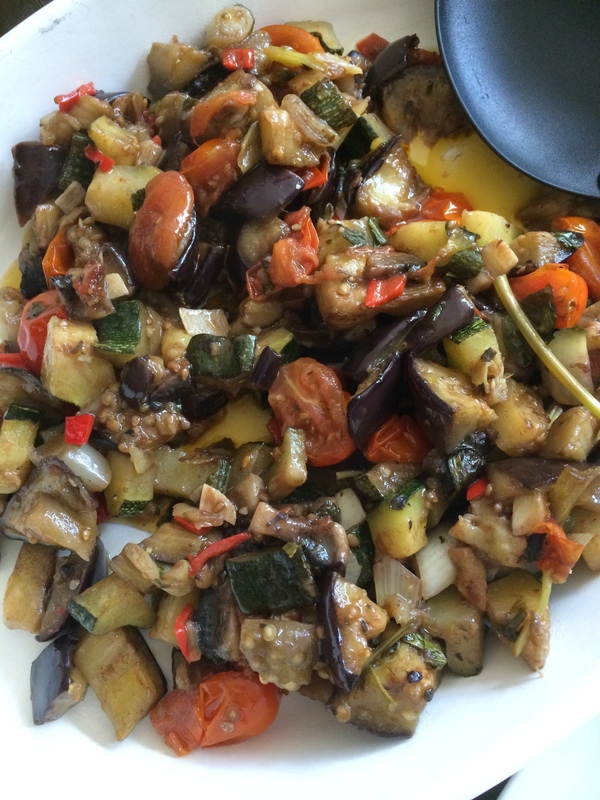 1 cucumber, ribboned – I use a potato peeler- don’t go as far as the seeds! Cook the noodles, remove from heat and toss in sesame oil. Leave to cool. Make the dressing – mix all the ingredients together – adjust to your liking. Brush steaks with olive oil, heat a frying pan or griddle, and cook the steaks for 2 minutes each side for rare or 3 minutes for a more medium rare look. Sesame well with sea salt and black pepper and leave to one side to rest. Put the carrots, radishes, cucumber into a large pan or bowl – I used a large roasting tray and mix. Add the lettuce, spring onions, chilli and the noodles and toss gently. Slice the beef thinly and add to the mix. Add the sesame seeds and fresh herbs and toss gently. Then, just before serving, pour over the dressing, and toss again lightly. This proved immensely popular with my family and there was absolutely zilch left at the end – a very good sign. 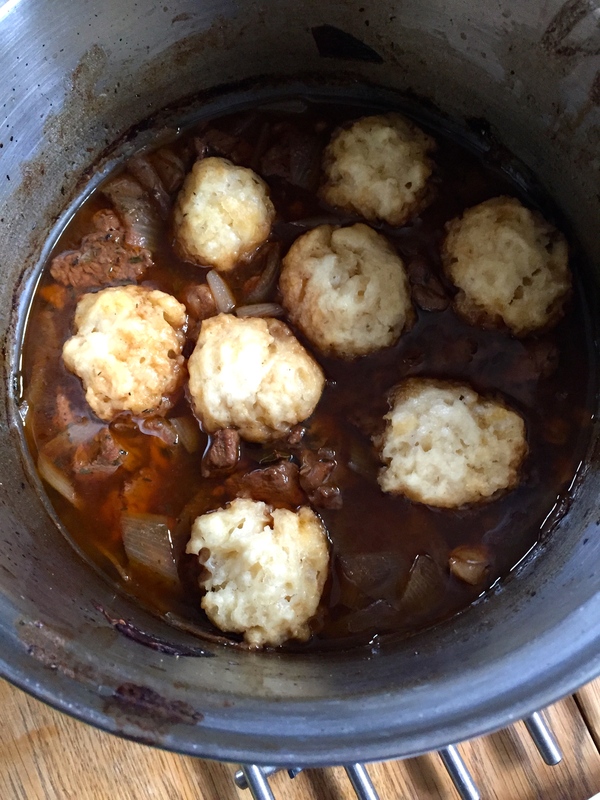 This is one of the best ways there is to cook and eat beef…believe me. It is easy to do, saves on washing up and it is quick! Well, relatively! Perfect for a barbecue on a World Cup night. In Brazil this is a typical way to cook beef. Get a good piece of silverside of beef (perfect for this dish as it is inexpensive and takes the heat perfectly – ending up as tender as can be) with no fat on. Rub it all over in salt. Put your barbecue on and let the coals get to white heat. Put the beef onto the grill and treat like a large sausage! Keep turning it over for half an hour. You will get a few flames at first but it will soon calm down. 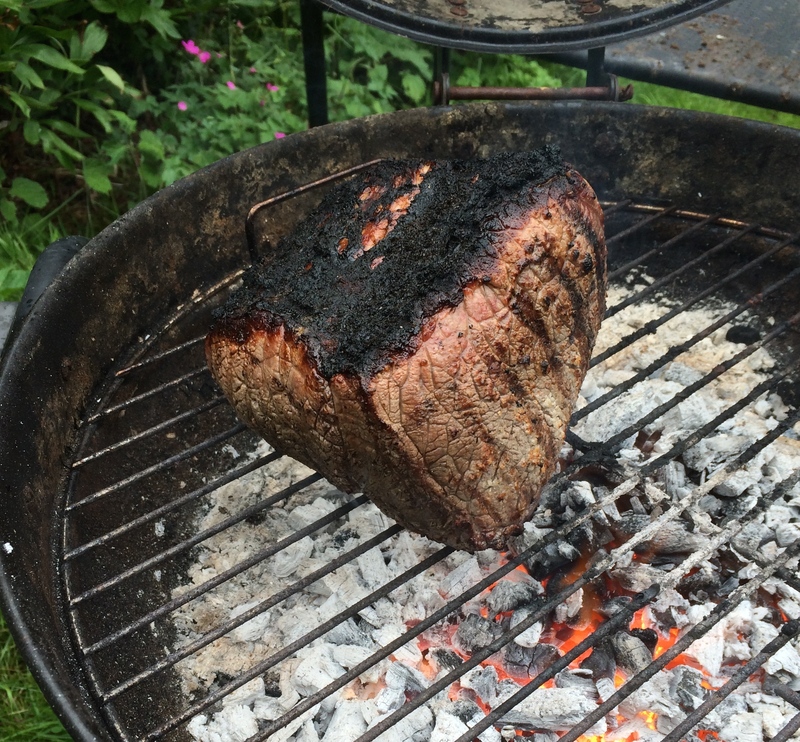 After 30 minutes of turning you will end up with a wonderfully dark crusted piece of meat. Take it to one side on a board and carve off the crispy bits and serve straight away. Pop the joint that remains back on to the barbecue and continue turning as it cooks. This is a meal to savour and not rush – eating in a series of stages. The next round the pieces sliced off after about 10 minutes will be beautifully medium rare. 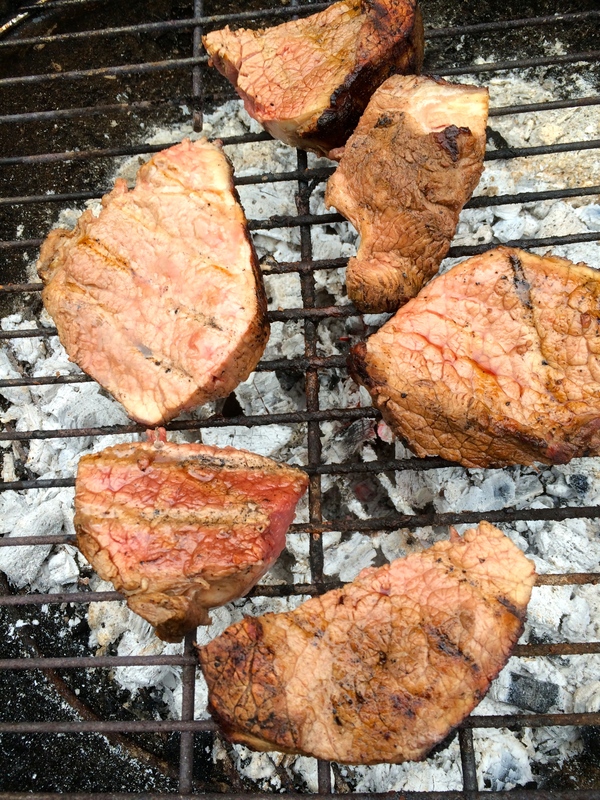 Then cut the remaining joint into steak size slices and place back on the barbecue for a further 10 minutes whilst you enjoy the meat you’ve just carved. I served it with buttered coriander new potatoes and lamb’s lettuce (mâché). This is such an economical and gloriously tasty way to eat beef. The Brazilians have got it wrapped. Perfect. 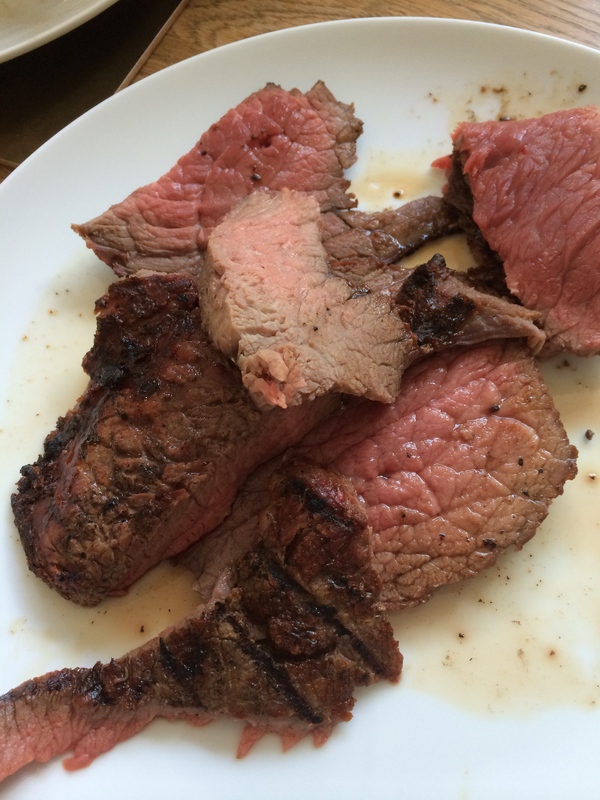 My son, the steak aficionado in our house, announced that this was probably the best way he has ever eaten beef. I have to agree with him. Magical. Nothing else to say really…the pic says it all. I enjoyed this fab steak at Brasserie Blanc in Winchester earlier this week. It simply melted in the mouth – cooked rare, or at the very most, medium rare with a pepper corn sauce on the side it is a delectable delight and incredibly tender. If you are ever in Winchester – you must visit this restaurant. 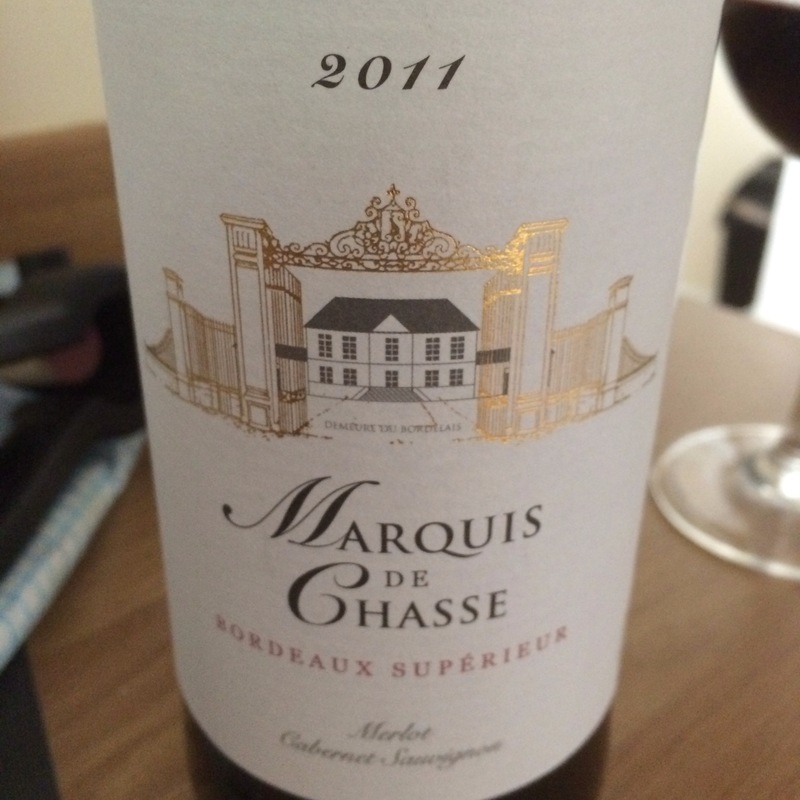 It is light, stylish and you feel as if you are deep in French territory. 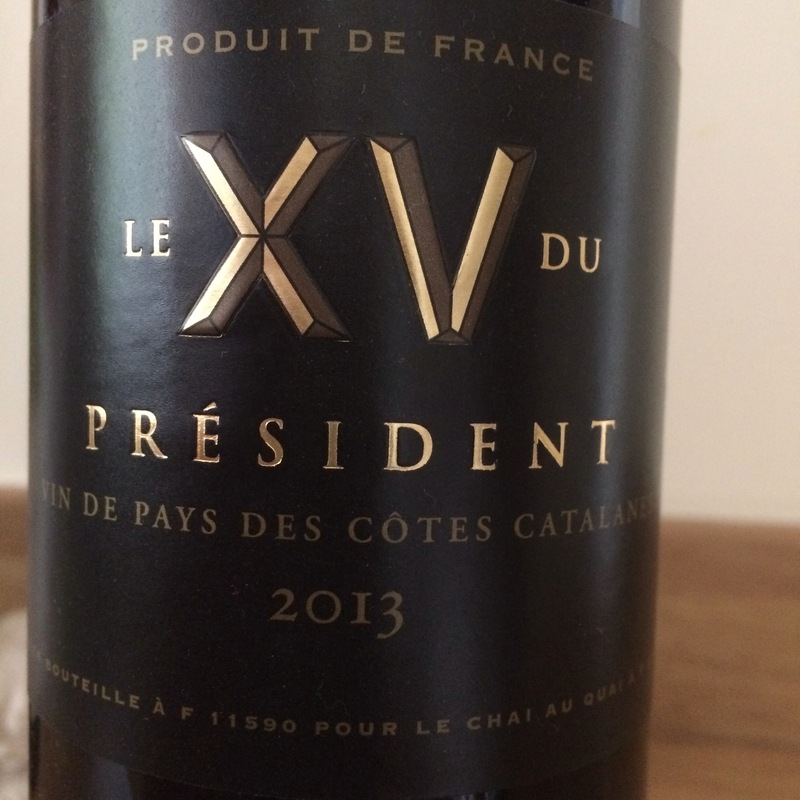 Marvellously polite and unobtrusive staff….a wine list to die for – the Côtes de Bourg was full of velveteen finesse. A perfect accompaniment to the steak. Onglet comes from the hanging flank of the cow and is known as, unsurprisingly, ‘hanger steak’ in the U.S. and where I am from we call it ‘skirt’..the Italians call it ‘lombatello‘ and the Spanish ‘solomillo de pulmón‘. 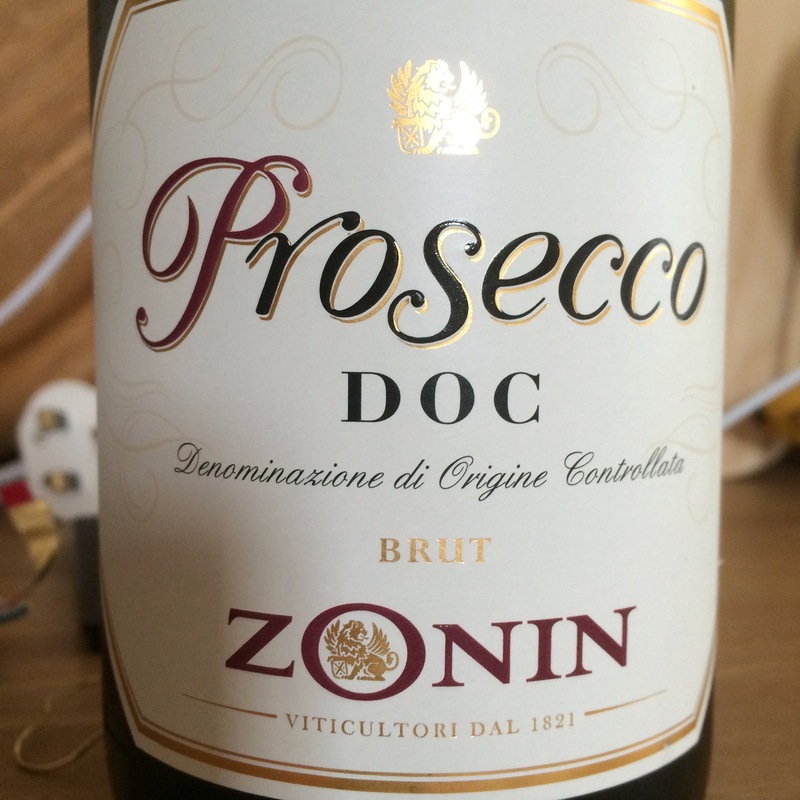 Whatever you call it, this is a remarkable cut – inexpensive and highly regarded for its immense flavour. When I first set eyes on this latest painting from the wonderful Bonnie Lalley, I was immediately reminded that I had not made any of my own bresaola for over two years! Not good. The time is ripe for making another – thank you for the prompt, Bonnie! Lemon and beef are such an Italian pairing – they squidge a shot or two of lemon over their carpaccio and their bresaola at will. And basil and lemon are seemingly ever present in any mediterranean kitchen – as essential for summer cooking as a bucket and spade are for a trip to the beach! Bresaola is an air dried beef, aged traditionally for two to three months. 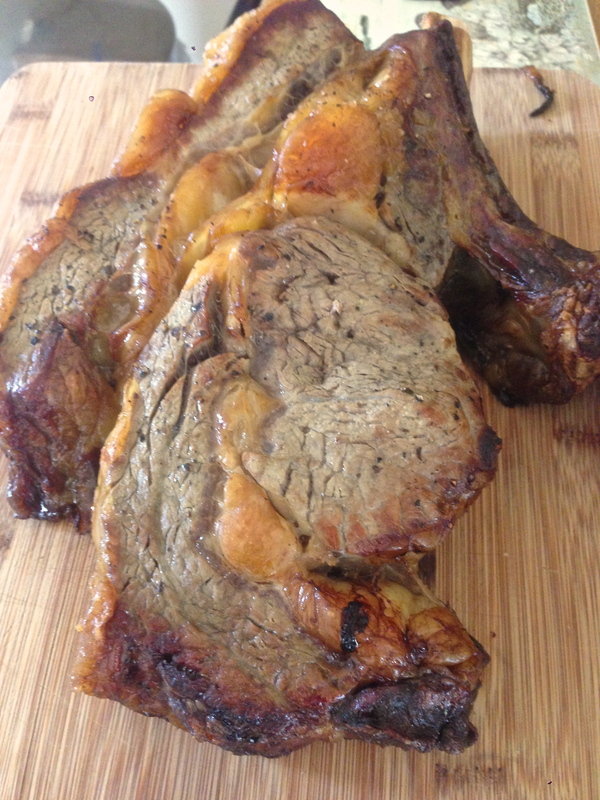 I always use topside – it is possibly the best thing for this cut I reckon. 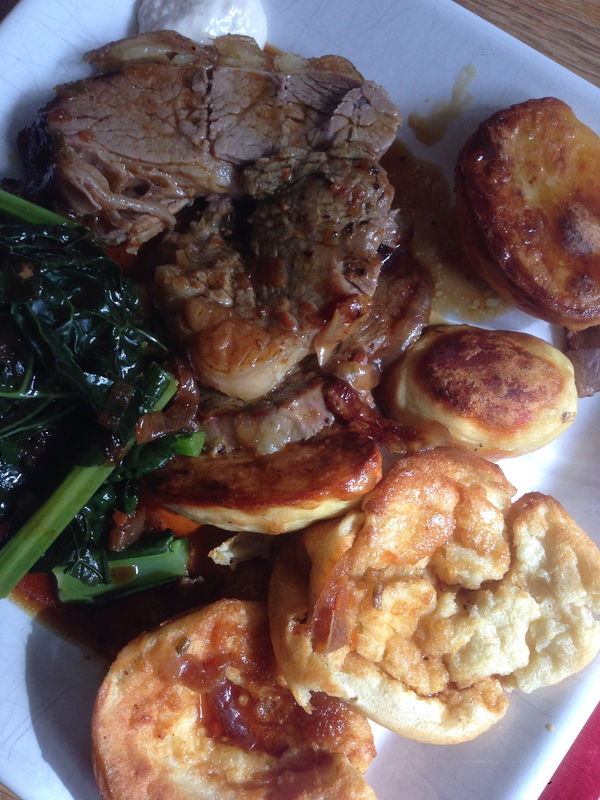 You could use silverside too if you cannot get hold of a piece of topside. The word Bresaola (formerly Brazaola, Brisaola or Bresavola) has uncertain origins. Its etymology can be found in words like “brasa” (embers) or “brisa“: “brasa” were braziers used to dry air in the rooms used for seasoning process while the second one, brisa, is a dialect word for “salting”. It comes from a valley called Valtellina in the Northern Italian Alps in the Lombardy region. There are of course similar products around the world – chipped beef in the States, cecina in Spain, dendeng from Indonesia and brési from France. Bresaola can be traced back to the 14th century in Italy and like so many cured meats, it was mostly farmers and their families who ate it – it was very much a way of simply preserving meat and it only escaped from Italy in the 19th century, first being exported to Switzerland, just across the border. It seems to be available in lots of places now, though I assure you, supermarket bresaola is nothing compared to those you can buy in Italy – or off a deli counter here in the UK. or indeed to your own home made version! It is served mostly as an antipasti – or with salads – and is often seen added at the last moment to the magnificent pizzas they serve in the Piazza Navona in Rome, with large curly shavings of parmesan and a handful of fresh green glimmering rocket, drizzled with olive oil and lemon juice. 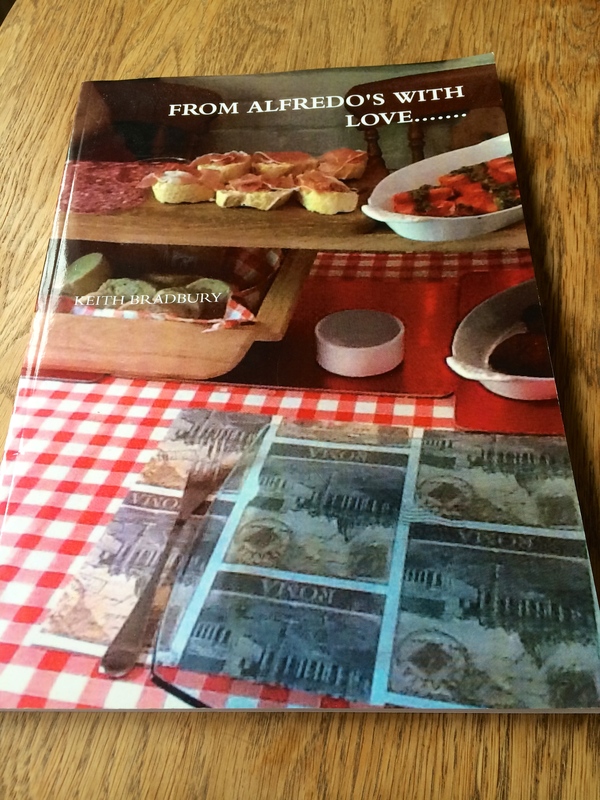 Right, my home cured bresaola is based on Hugh Fearnley-Whittingstall’s version from his magnificent tome simply entitled, ‘Meat‘. Mix together all the ingredients in a non metallic container that will hold the joint comfortably – indeed snugly. Add the meat and turn over to coat it well. Cover and leave in a cool place – a fridge will do if you have one large enough – otherwise an out house is fine. It needs to stay there for 5 days – but twice a day turn the joint over. After 5 days, remove the joint and pat dry with a clean tea towel. Wrap it in a double layer of muslin cloth, tie up with string and hang it in a dry but cool and draughty area, such as an outbuilding or covered porch. Let it hang for at least 10 days. 15 would be even better. You will feel that it has become hard to the touch. Wonderful! Trim before serving. Take away the outer 5mm from the bit you are going to slice. Slice very thinly across the grain of the meat. It will be browner on the outside than the centre – that is as it should be. It can be hung in a cool place for a month and used as and when you need it. If the weather gets too warm you could pop it in the fridge. Always keep it wrapped in the muslin. Never cling film! It needs to breathe. That is why the stuff you buy from the supermarket in clear air tight plastic trays needs to be opened at least an hour before you serve it. I made my first home cured bresaola one with my daughter, Hannah, and she loved the whole process. It is a great thing to do – fun indeed for all the family! And richly rewarding! This was last night’s supper. 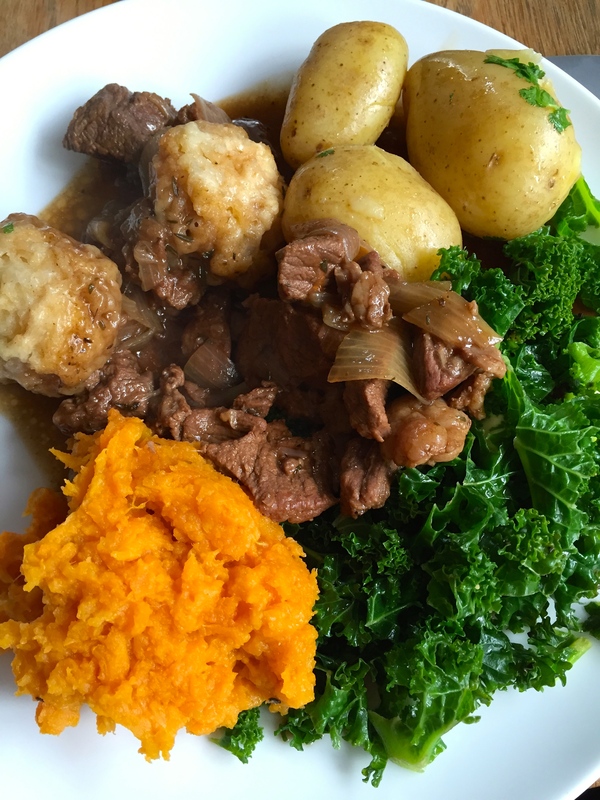 The shin beef was from those marvellous people at Parsonage Farm in Upton – please visit their website – Sarah and John Mills are two of the nicest farmers you could meet – they also butcher their own meat and have also moved into making their own salamis! They know their stuff. This dish shows shin beef at its very best – it is such a marvellous cut and highly underrated. Yes, it takes time to cook, but time well spent. I put this together in about 20 minutes and then popped it in the oven and went out for the day. I came home to the most marvellous aromas – what a welcome! Preheat the oven to 150c. 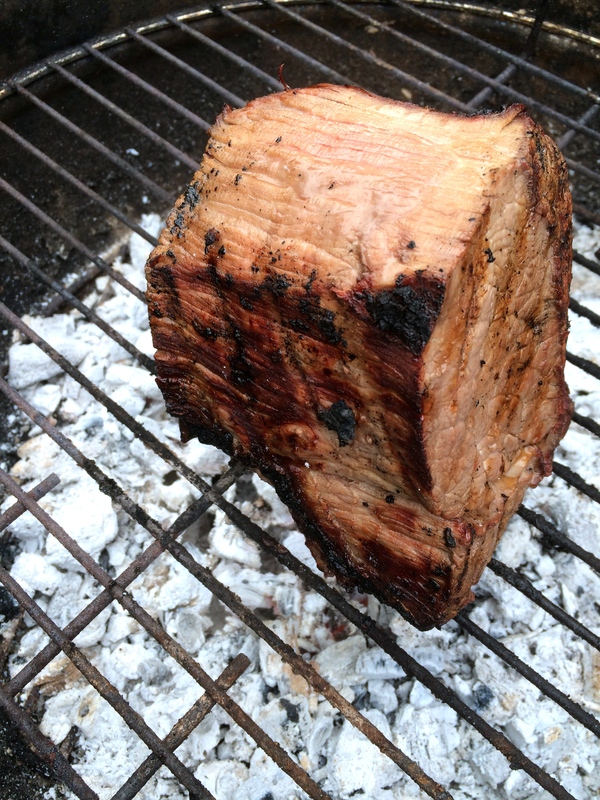 For 6 folk I used a kilo of shin, cut into large chunks. I used a heavy round casserole dish with a lid. I arranged half the beef on the bottom – added 5 whole peeled cloves of garlic, two sprigs of rosemary and 3 or 4 good grinds of black pepper. 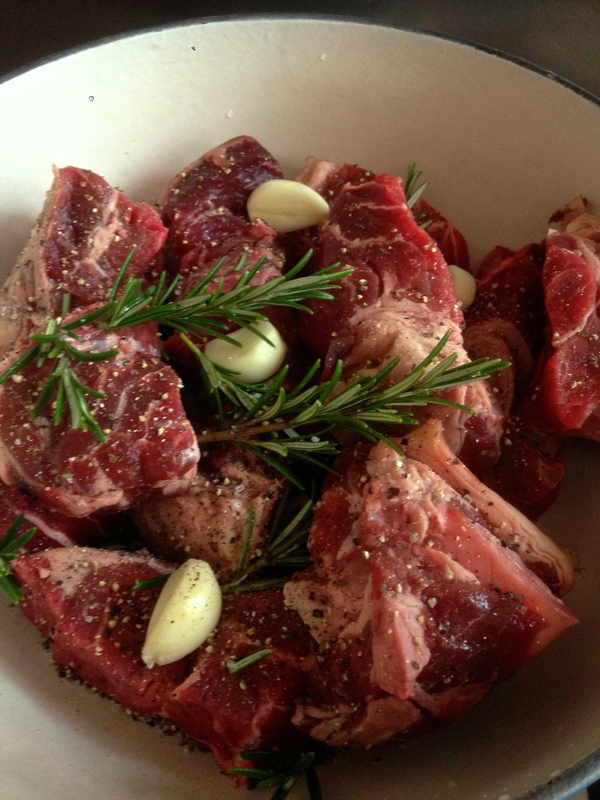 Then I popped the rest of the beef on top, plus 5 more cloves and more rosemary and more black pepper. Then add a whole bottle of a good red, preferably Italian. Add 2 bay leaves. Pop the lid on and bring to a gentle boil on the hob. Then place in the centre of the oven for at least 6 hours. When it is ready check the seasoning – I added just a whisper of sea salt and a light drizzle of love oil. Then I removed the beef with a slotted spoon and broke it up gently with 2 forks – it drifts part in the most dreamy fashion. I served it with steamed cauliflower and baby new pots with a taleggio and cream sauce. This is beef at its best. Full of rich dark flavours that haunt the tastebuds and make them crave more! Often the simplest things in life are the most beautiful. The things we take for granted – golden leaves, a sparrow’s song, ripening berries peeping through hedgerows , snow drops peeking out from under the soil where they have slept peacefully during the dark drear months of winter. And so it is with food – often food stuffs we overlook or turn our nose up at can provide delectable surprises. Inexpensive and warming when the wet weather whirls its way through our world. Take the humble tin of corned beef. I loathed it as a child – all my sandwiches on school trips seemed to contain nothing else but slabs of it and I found it hard to swallow. 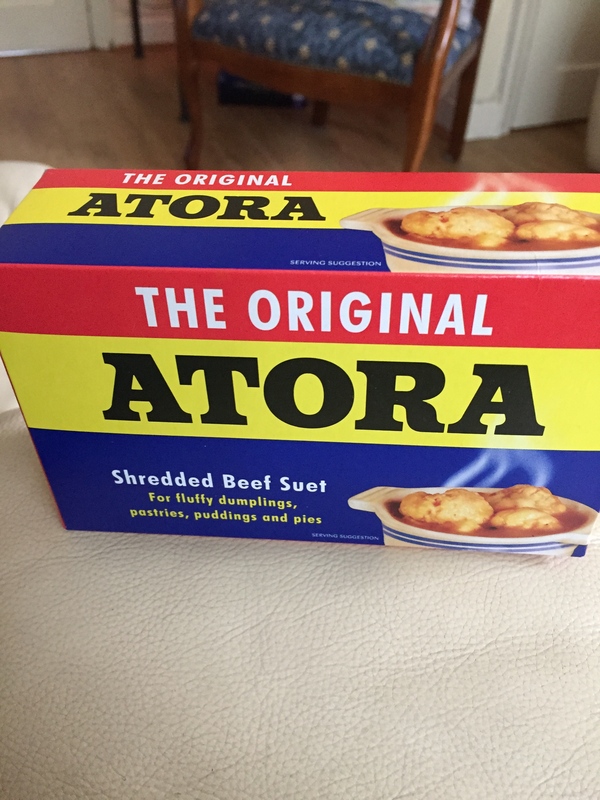 I remember my Granddad telling me tales of WW1 and life in the trenches when frequently the only dish on offer was tinned ‘bully beef’ as he called it. Sounded grim! The stuff sold in cans gets its name from the corns, or grains of salt, that are used to preserve it. The beef is chopped up and preserved with salt – sometimes it was brine – and canned with beef fat and jelly. When I was young there seemed to be too much of the jelly for my liking! Today most of the corned beef in cans comes from Uruguay or Brazil. It was first mentioned in 1621 in a recipe of one Robert Burton in his ‘Anatomy of Melancholy‘ -clearly he too had been getting corned beef sandwiches too often in his packed lunch! Anyway, he writes ‘ Beef…corned, young of an Ox.’ He also mentions that you could get corned pork . Corned beef in many parts of the world refers to salt beef – a wonderful cut from the brisket – we used to eat a lot of it when we lived in New Zealand. Corned beef in the UK means the stuff that comes in those trade mark rectangular cans with the pesky winding key opener. The Irish eat a lot of it apparently, especially on St Patrick’s Day – a combination of corned beef heated through with cooked cabbage. And of course there is the traditional corned beef hash which improved my opinion of the stuff when my folks made this stew in my early teens. Great with lashings of brown sauce. Corned beef also gets used in lots of pasties sold in the chains of high street bakers. But, my favourite way of eating it – and I have made this for many a long year, going back to my thrifty student days, is a Corned Beef Chilli. I cannot explain how good this dish is – and I know some folk out there will be grimacing or even switching to another blog at this point – which is a pity – because, as I said to begin with – the simplest and often the cheapest dishes are the best. Right, assuming you are all still with me….! The recipe! 1 can of corned beef chopped into chunks. 500 gm rigatoni pasta (for some odd reason, it goes far better with pasta than rice – believe me. 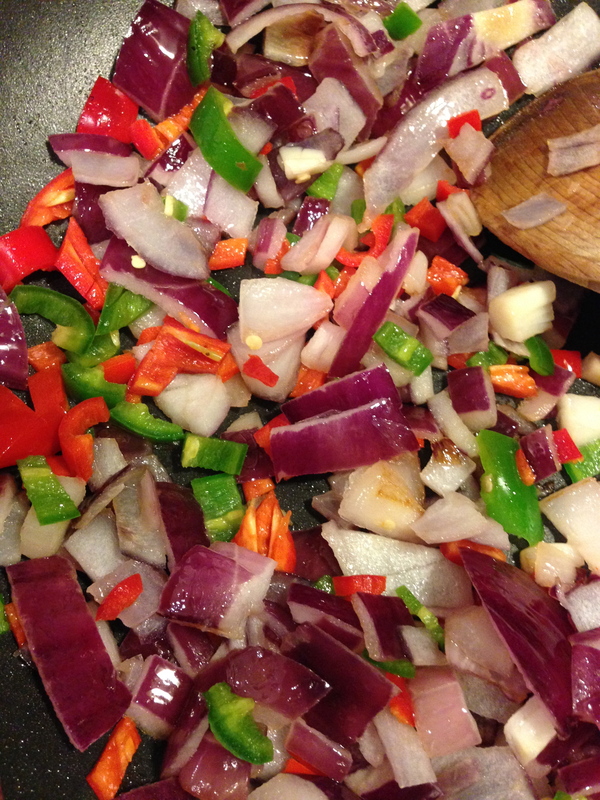 In a frying pan, heat some olive oil and pan fry the onions, garlic, chillies, and cumin seeds. Let the onions soften, then add the tinned tomatoes and bring to a good simmer. Cook for about 20 minutes on a low heat. Then add the corned beef and stir around gently. Now add three quarters of the bunch of coriander chopped. Stir again. Let it simmer whilst you cook your pasta. It can happily sit there for another 40 minutes or so, getting thicker and hotter. Serve the pasta in bowls and spoon over the corned beef chilli. Add a sprinkle of chopped coriander to each bowl. It is like no other chilli you will have tasted and everyone for whom I have cooked it has been amazed at the flavour and deliciousness of this dish. Thanks, Bonnie, for the inspiration. A wonderful painting to go with a wonderful winter warmer of a meal!